Star anise is a popular spice that is notable for its distinctive star-shaped appearance. Commonly employed as a culinary spice in many parts of Asia and some parts of Eurasia, it is commonly mistaken for aniseed (Pimpinella anisum) mainly due to its similar flavor and aroma profile. This misconception usually stems from powdered specimens which no longer lack the identifying 'look' unique to star anise. 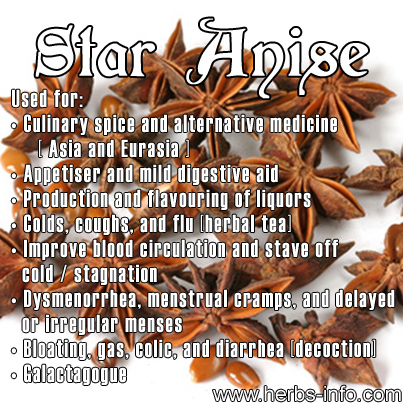 Despite being used as a substitute for the more commonplace aniseed in most European applications, the star anise is a distinctly Asian spice with a long-standing medicinal reputation especially in Traditional Chinese Medicine. Star anise also plays a major role in Chinese, Vietnamese, Korean, and even Indian cuisine, and, like aniseed, is a very versatile spice. The star anise plant is a medium sized evergreen bush that typically prefers shady areas, or places that obtain only moderate amounts of light. It is a native of China and Vietnam, although some species also thrive in Japan, Korea, India and Malaysia. Like true aniseed, it is the fruit of the star anise – a distinctly star-shaped pericarp – which is harvested and subsequently dried for use as either a medicine or a spice. Unlike true anise on the other hand, the star anise's leaves, bark, and roots do not possesses any known medicinal applications.